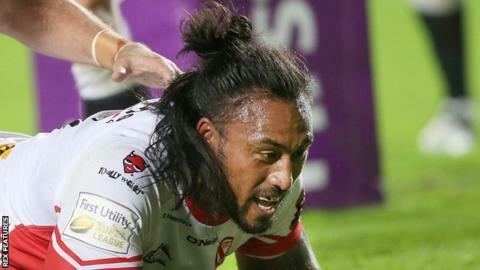 Two tries from Atelea Vea and Jack Owens helped St Helens boost their chances of a Super League play-off place by beating leaders Hull FC. The Black and Whites, who beat Warrington to lift the Challenge Cup on 27 August, went ahead when Mahe Fonua touched down in the right-hand corner. But Saints led at half-time with tries from Owens and Matty Fleming. Vea went over twice and Owens got his second, with Sika Manu's try little consolation for the visitors. Saints stay fourth in the table, six points clear of Dragons in the final play-off place. Shaun Michaels almost brought about a nervy finish for the hosts, but he was pushed out into touch by Adam Swift before being able to get the ball down. Vea and Owens' second tries then sealed victory for Saints. Hull FC, who rested several players from the side that won the Challenge Cup at Wembley for the first time, will lose top spot if Warrington beat Catalans on Saturday. St Helens: Lomax; Owens, Peyroux, Fleming, Swift; Turner, Fages; Walmsley, Roby, Richards, McCarthy-Scarsbrook, Greenwood, Wilkin. Replacements: Amor, Vea, Ashworth, Knowles. Hull FC: Shaul; Michaels, Fonua, Talanoa, Naughton; Pryce, Abdull; Bowden, Washbrook, Green, Manu, Hadley, Thompson. Replacements: Downs, Watts, Paleaaesina, Pritchard.